The very title of this collection of decadent stories - Rust of Gold - suggests its themes: beauty and decay. In "Grass Upon the Housetops," a chivalrous man, attempting to hem his lover's dress, swallows the needle, with beautiful and terrible consequences. In "The Skirts of Chance," a famous poet renowned for his chastity must choose between his artistic integrity and his newfound love. And, in the gem of this collection, "A Ghost of the Sea," a well-known London lawyer flees to the remote countryside, seeking to escape horrific visions of the ghost of his drowned lover. 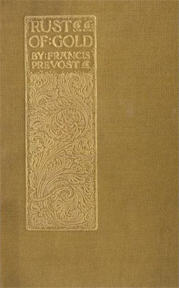 Combining the decadence of Huysmans with the savage wit of Oscar Wilde, Rust of Gold (1895) was the first book by H. F. Prevost Battersby, who wrote under the pen name of "Francis Prevost." Despite its critical and popular success when first published, Rust of Gold has fallen into obscurity today with copies surviving in only five libraries worldwide. This new edition follows the first edition of 1895 and includes a photograph of the author and a reproduction of the cover of the first edition.